There are no comments for Hawaiian Tropical Plumeria. Click here to post the first comment. 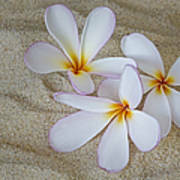 Hawaiian Tropical Plumeria (common name Frangipani) is a genus of flowering plants in the dogbane family, Apocynaceae. 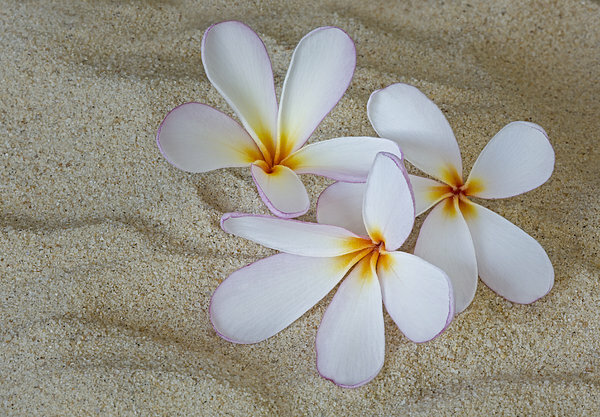 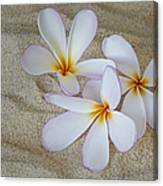 These particular blooms are white and pink with bright yellow in the center and are sitting on top of beach sand.. Plumerias are tropical trees famous for their gorgeous flowers which are used to make leis (floral garlands).